Chuck Winter, retired Grace Brethren pastor in Sunnyside, Wash., points GraceConnect readers to an article about his son, Yakima County Sheriff Brian Winter, who grew up in the Grace Brethren Church in Harrah, Wash., and attended Grace College. A portion of the story appears below. Click here to read the complete article, on page 3 of the link. He is a God of love, but also of strength and protection. A walk through the Old Testament might amaze those who’ve never cracked the spine of a Bible. We serve a fierce Creator who is like a mighty warrior! 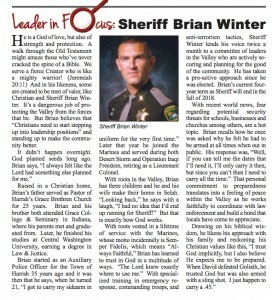 (Jeremiah 20:11) And in his likeness, some are created to be men of valor, like Christian and Sheriff Brian Winter. It’s a dangerous job of protecting the Valley from the forces that be. But Brian believes that “Christians need to start stepping up into leadership positions” and standing up to make the community better. Raised in a Christian home, Brian’s father served as Pastor of Harrah’s Grace Brethren Church for 25 years. Brian and his brother both attended Grace College & Seminary in Indiana, where his parents met and graduated from. Later, he finished his studies at Central Washington University, earning a degree in Law & Justice. Click here to read the complete article, on page 3 of the link.